Click on Site at the top of your screen. Paste or type in a link in the "Enter a website address" field. 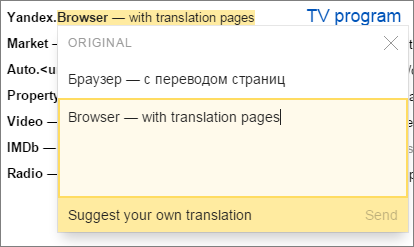 Yandex.Translate automatically detects the language to translate the page from or to. If this doesn't happen automatically, select the languages you need from the drop-down list. You can also translate webpages by simply pasting in the link in the Text section, and then clicking on the link that appears in the translated field. Clicking this will take you to the Site section, where you will see the translation of the webpage. By default you will see the translation of a website with two tabs on top: Original and Translation. To change the way translation results are displayed, use the menu in the top right corner of the screen. If you find a problem with a translation, hold your mouse cursor over the translated phrase in question. A pop-up window will appear, where you can click Suggest your own translation, type in your suggestion, and then click Send to complete the process.